It turned out to be more than just a fun game to watch -- it became one of college football’s legendary endings. Michigan was sitting on a 26-21 lead with six seconds left in the game. Colorado had to go 64 yards to the end zone. A majority of the 106,427 fans in attendance assumed a Wolverine victory was close at hand. However, the woman sitting in Section 1, Row A, Seat 5 wearing a No. 81 Colorado jersey didn’t lose faith. She reminded the Colorado fans around her that something special was about to happen. Who was that woman? Mercy Westbrook -- the mother of Colorado receiver Michael Westbrook. “Did I believe? I always believe. I’m a mom,” she told The Chicago Tribune. When Kordell Stewart slung the football 73 yards to Westbrook, catapulting Colorado to a 27-26 victory, to the lay person the play looked chaotic. But it turned out just the way offense coordinator Rick Neuheisel drew it up. 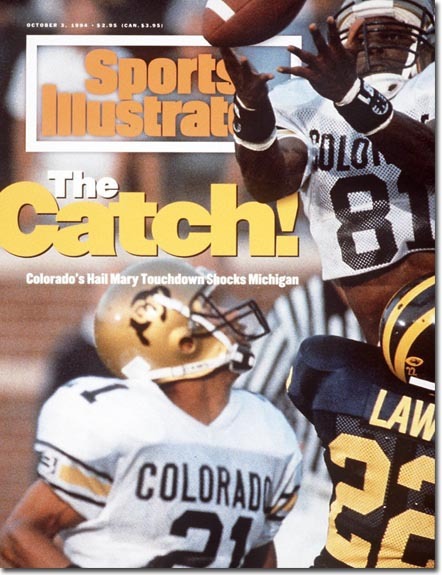 It was actually the second time Colorado ran the play against Michigan, the first time at the end of the first half -- the ball was intercepted by Michigan’s Chuck Winters. The play was called "Jets, Rocket, Left, Victory." If you wanted to translate that phase from football-speak to English it was this: Three receivers lined up left (Jets), run to end zone (Rocket) and hope someone in a Colorado jersey pulls down the ball (Victory). The three Colorado recievers -- Westbrook, Blake Anderson and Rae Carruth -- all streaked downfield. Westbrook, because he was the tallest Colorado receiver at 6-4, was supposed to outjump everyone and tip the ball to Anderson or Carruth in the scrum. As the ball came toward the end zone, three white jerseys and four blue jerseys fought for the ball, but only one would come down with it. Anderson tipped the ball away from Winters and into the hands of Westbrook. Westbrook caught the tipped ball off the back of Michigan cornerback Ty Law and fell to the ground clutching the pigskin. When the officials threw up their arms and signaled touchdown, all the noise was sucked out of that giant coliseum in Ann Arbor, Michigan. “Only a guy with Kordell's ability could throw that far -- and stay alive to throw that far," Colorado coach Bill McCartney said after the game. "Actually, I didn't think he could throw it that far." The Buffs never attempted the extra point and left Michigan Stadium with a 27-26 victory. The scoreboard operator appeared to be in shock, as well. It took nearly a minute for the board to flip. The Buffaloes ran the play every Thursday at the end of practice. It turns out practice really does make perfect. The game was a sort of homecoming for two Buffaloes -- Westbrook and McCartney. The game against the Wolverines was the only chance Westbrook would have to play in Michigan Stadium; the home team never recruited him. The contest also marked a return home for McCartney, a Michigan native. McCartney and Michigan coach Gary Moeller were both given their first college coaching job in Ann Arbor by the legendary Bo Schembechler. They both worked under Schembechler in the 1970s and this game marked the first time the two men faced each other. After the game, both coaches reflected their teams' feelings accurately. Colorado would continue its impressive streak throughout the 1994 season. The Buffaloes finished the season 11-1, falling only in the regular season to Nebraska and capping the campaign with a victory against Notre Dame in the Fiesta Bowl. Michigan would not be so lucky. The Wolverines finished the season 8-4, losing games to Penn State, Wisconsin and Ohio State. Moeller’s squad did capture the Holiday Bowl trophy, defeating Colorado State.